Ferrari and its customer teams collected a win and two podium finishes in the first race of the Blancpain GT Series Endurance Cup, held in Monza. The 488 GT3 was once again competitive and with a bit more luck would have won. Pro class. Ferrari crews were caught up in a chaotic start in the Pro class. Miguel Molina, in car no. 72 of SMP Racing, got off to a great start, which saw him in the lead at the entrance to the first chicane. Immediately behind him was the Bentley no. 7 of Guy Smith that in pulling ahead of the no. 50 488 GT3 of AF Corse team touched the Lamborghini no. 19 of Ezequiel Perez-Companc, sowing panic among the group and putting ten other cars out of the race, including the Ferraris of Lorenzo Bontempelli (AF Corse) and Mirko Zanuttini (Kessel Racing), with Marco Cioci, in the 488 GT3 of Kaspersky Motorsport, pulling off a miraculous manoeuvre to emerge unscathed. Molina drove to the first pit stop when he handed the wheel to Victor Shaytar. At that stage the Lamborghini of Grasser Racing with Engelhart-Bortolotti-Caldarelli took the lead, which it held to the end. Behind the 63 car the Ferrari of SMP Racing looked set to secure a podium before running into a drive-through penalty for overtaking under the yellow flag. The standard bearers of AF Corse, Alessandro Pier Guidi, Michele Rugolo and Pasin Lathouras thus inherited second, while the 488 GT3 of Kaspersky Motorsport climbed back up to fourth, finishing ahead of the car of Rigon-Shaytar-Molina. Am Cup. The Am Cup saw another triumph for a woman Ferrari driver. After Christina Nielsen won the title and three rounds of the IMSA series in 2016, now it was the turn of 25 year-old British driver Abigail Eaton, a competitor in last season’s British GT4 Championship at the wheel of a Maserati. At Monza she triumphed along with Italy’s Davide Rizzo and Lebanon’s Alex Demirdjian in the 488 GT3 of AF Corse. The crew of Ferrari no. 961 also came first in their class after starting from last position due to having to replace the gearbox, an operation that the AF Corse mechanics performed in a record time of 45 minutes. 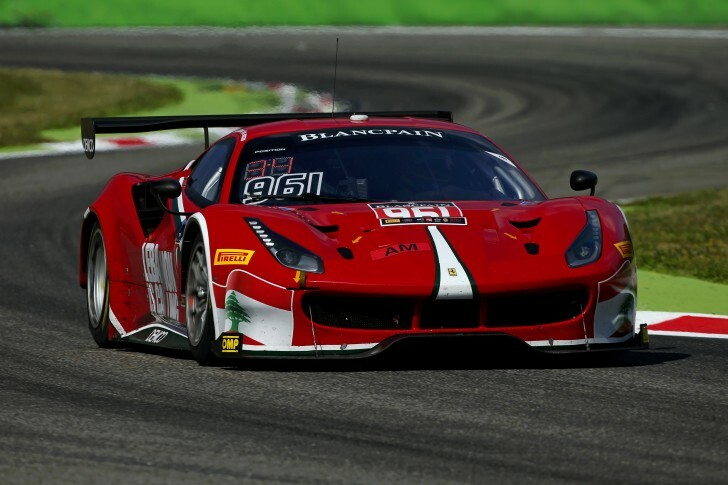 The same class witnessed an unlucky race for the 488 GT3 of Rinaldi Racing with Pierre Ehret and Rino Mastronardi, which had dominated for the first two hours. Pro-Am Cup. Ferrari also won a podium in the Pro-Am Cup where after a great recovery victory slipped from the grasp of reigning champion Michael Broniszewski with just two laps to go. The Kessel Racing team crew had been slowed by the accident at the start but Matteo Cressoni’s extraordinary stint put them in first position. However, in the end Andrea Rizzoli was powerless in the face of a comeback from the Aston Martin of Oman Racing Team with TF Sport of Jonny Adam who also clocked the race’s fastest lap. The Blancpain GT championship returns on 6 and 7 May at Brands Hatch for the Sprint Cup. The Endurance Cup returns to Silverstone on 13 and 14 May.